Intrepid Field Reporter Melissa Presents … ← You Want Me To Wear What? Why yes, this is a denim romper with molded cups. So good of you to notice! The one thing – ONE THING – this does have going for it is that the waist is clearly defined, unlike on most other rompers. The corseted top actually does give it a shape that’s not unflattering, per se. But it has those damn molded cups, and you know how I loathe them. There’s no way for molded cups not to look cheap. 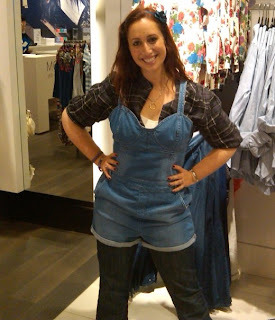 This romper is what Daisy Duke would wear in the CW remake of The Dukes of Hazzard. Which, again I would totally watch because it would probably involve Bo and Luke being estranged cousins who are competing for the spots on the high school football team, and Daisy would be their next door neighbor who they’re also competing for.